You are here: Home > Nokia 5230 T-Mobile Bound? With the inclusion of AWS (T-Mobile 3G) on the N900, it was clear to see that Nokia and T-Mobile were starting to warm up to one another. In fact, it is starting to look like we may be graced by another T-Mobile 3G ready Nokia soon. What makes us think this, you might ask? Well, the good ol’ FCC filings show an indication for support of our AWS bands. While it has been a while since T-Mobile has held a S60 based device in its ranks, what better way to kick things off than with a media centered, touch screen phone? Full specifications after the break and leave your thoughts in the comments! Nokia is finally looking more into T-mobile. This thing is legit, I was at a Nokia Event in Chicago for TMO, a Nokia rep confirmed this is launching, I played with it actually not a bad entry level device, certainly a good starting point for getting Nokia back in the U.S. game. i wonder if this nokia is going to have the symbian60 UMA capabilities baked in? i loved my E-70 but, nokia quit supporting it b/4 the UMA update to devices like the E-71. This looks like a really nice phone. If this would come out before Christmas I would get as a stocking stuffer for my daughter. I like the looks of it myself. But I'm getting the 9700 come Monday. I don't mind getting this phone as long as T-Mobile doesn't force the smartphone data plan when buying on contract. It's an UMTS only phone and even though it has S60v5, it should be considered as a phone first device just like the Shadow. S60v5 is a smartphone OS…. so according to TMo, it should require the same data plan as other “smartphones”. It's all rubbish in the end because all Nokia Symbian phones ONLY need an “Internet Connection” and my $5.99 Tzones has been working for years on our N82 and E63! That's true but how do you explain the T-Mobile Shadow (WM smartphone)? A fluke. :D TMobile must have been feeling generous the day they made the decision. In the end it boils down to an arbitrary decision on the part of the bigwigs @ the head of the company and which database they program the IMEI's into. We also have a Tmobile Wing on a $5.99 plan. It all comes down to companies charging whatever they want as Bill48105 so creatively said. This whole “Smartphone” Data plan fiasco has kep me from buying ANY carrier locked phones in the last few years (Get it unlocked, keep my 5 lines of Tzones). It is a joke. A tmobile rep tried to tell me that their smartphone plan would be needed to “unlock features” of my wifes E63. Seriously?!? The phone is already unlocked, TMo isn't stopping the phone from doing anything that it is designed to do. He didn't know who he was talking to. I didn't discover the internet yesterday!!!! Carriers are guilty of this because the Execs really did sit and say “Hey, they will pay for it, let's do it”. It is the same thing with college application fees! They CHARGE us to see if they will accept us to CHARGE us for being accepted! You would think it would be free to apply to get into years of debt…but that is another story for another blog….. Exactly why I stopped getting my 5 'free' phones from ATT every 2 years.. (They were staggered so ended up every few months) There was no way in hell I was going to go from $15/m unlimited data plan that worked just fine on my current phone (S710, Touch Diamond, etc) to a REQUIRED $35/month data plan to get a Fuze or whatever which gained me nothing other than the warm fuzzy feeling that I wasn't abusing ATT or taking advantage of the system by using a plan I wasn't supposed to be using on the phones I used it on even though I rarely hit 100MB of data per month & am usually under 10MB! The problem is that ATT started detecting IMEI & knew I put my SIM in Fuze & warned me. I signed up for TMobile to find they lock their data down even worse than ATT because at least with ATT I could still use any unlocked phone but now with TMobile unlocked phones always give me the 'you must upgrade your account' BS. And YES it does that with my crap S710 phone even which isn't any more of a smartphone than my Shadow which works on the cheap $10 plan. Any non-Tmobile phone I've tried that isn't on their OK list gives the upgrade notice which is crap. I could see if I abused it & did GB's per month but I don't so WTH should I have to pay so much for a data plan because of the phone I have? The cell companies will call it what they want. Seriously though all but the most basic low-end phone is 'smart' so it boils down to $. They want more money out of you so they'll bend you over when they can. I was super shocked the Shadow only requires the $10/m data plan since it's Windows Mobile & can do Exchange server etc. (Never tried tethering but imagine it works or can be mod'd to work) But eventually they'll force the higher priced data plans on as many as they can, just sometimes they try not to push the public too hard for fear of backlash. Just don't get me started again on why unlimited data on some phones costs more than unlimited data on other phones when if it shouldn't matter..
Oh I know. I never understood why data on some phones are different for others. That's not fair or right! Why should there be a difference because of a person's phone preference? Not to shabby… fits my expectations.. lets go tmo! but waitin for that G1v2 in sometime Q1 may be worth the wait. You know I gotta promote it! The free phones are always to bait you and try to lock you into a contract where at some point you will end up paying them more money, and you can’t pull out because you signed a contract. This’ll be a cool phone for certain people. I also just noticed something interesting on boygeniusreport.com. The picture of the HD2 shows it running on T-Mobile, and the N900’s specs show T-Mobile’s WCDMA bands, which are not used by anyone else in North America. I know somebody who has one of those devices that they purchased unlocked, and it’s a very attractive device. It’s apart of their Xpressmusic line, and it’s media player is above average as far as they come. If T-Mobile doesn’t price it too high (my friend bought theirs for around $230 unlocked) then T-Mobile might have a winner on their hands. This is exactly the phone I have been impatiently waiting for to replace my ancient S60 6600. I say that there is no beating Nokia quality/durability. But if it is going to require a $30data plan, I will pass. 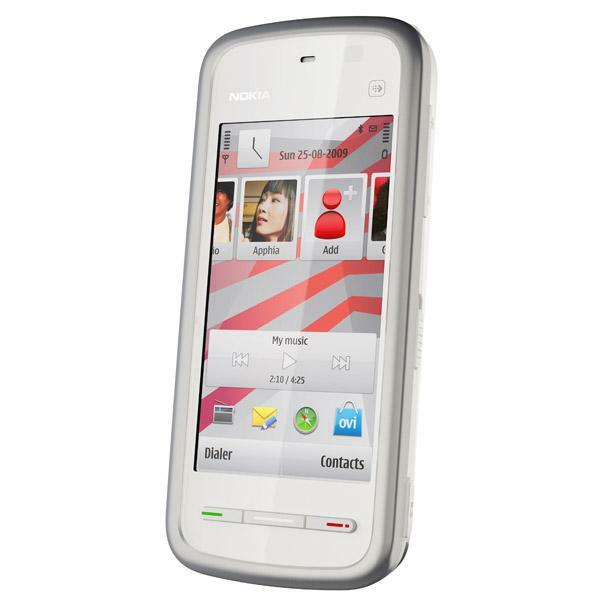 I love my nokia 5310 xpress music and I was about to buy the 5530 xpress music. I might just wait for this. I hope it turns out to be true! I remember I checked FCC info (re-directed from phonescoop) a few days ago, I got 3G 850/1900, but now when I click same link from phonescoop (same RM-593), I got 850/AWS. hey tis fone actually looks good nokia starting to get better now if this phone “require” a data plan then that is just BS does it require a data plan? I believe it will require a data plan since it is “considered” a smartphone. i dont get it though isnt the behold 2 also consider a smart phone? why doesn’t it need a data plan? I just purchased the 5230 and i’ve had nothing but problems with this phone. The internet is not that great, nor it’s email capabilities. The instruction book has limited information. I’m not happy with this phone at all… Should’ve kept my BB pearl!